Many journalistic articles and a few academic ones have been published on the occasion of the half century of the Cuban revolution comparing that nation’s economic and social situation in 1958 and 2008. Such exercise is complicated by serious methodological problems that have not been properly analyzed. This essay summarizes the swings of economic policy in the last 50 years; explains the difficulties in comparing indicators at the two historical points and introduces some techniques to cope with them; evaluates with standardized statistical tables the progress, stagnation or reversal in the domestic and external economy as well as in social services; ranks Cuban indicators within Latin America in 1958 and 2008; and summarizes the balance in Cuban economic-social performance. The three general conclusions of the essay are: (1) most economic indicators deteriorated under the revolution; (2) most social indicators improved; and (3) the economic and social situation in 2008 was worse than in 1989. On the eve of the revolution, Cuba was among the leading Latin American countries in several economic and social indicators, such as gross domestic product (GDP) per capita, inflation control, fiscal stability, investment as percentage of GDP, literacy, infant mortality, life expectancy and pension coverage. But it also confronted serious problems: a low rate of economic growth that benefited primarily the business sector and the employed labor force; a sugar sector that was basically stagnant and a non-sugar sector that was growing but at a pace insufficient to generate vigorous economic growth; high open unemployment that worsened during the period after the sugar harvest; remarkable gaps in socioeconomic standards between urban and rural areas; and high dependency on sugar exports and on economic-commercial links with the United States. The economic policy of the revolution has been characterized by “ideological and pragmatic cycles” (moving away from and approaching the market, respectively) that have resulted in deterioration during the former and moderate improvement during the latter (Mesa-Lago, 1994, 2000; Mesa-Lago and Pérez-López, 2005). The enormous and virtually free aid received from the USSR2 was a positive factor in the growth of the economy with respect to output and social services, which reached their zenith between 1985 and 1989. But the collapse of the socialist camp caused a grave economic crisis (GDP fell 35% in 1989–1993) and the deterioration of social services: the so-called “Special Period in Time of Peace,” now near two decades old. Moderate economic reforms introduced in 1993– 1996 promoted some decentralization, expansion of the small but dynamic private sector, and a partial recovery. But in spite of their beneficial effects, the reforms were virtually paralyzed in 1996 and, in 2003, Fidel Castro reverted them partially through economic recentralization measures and reduction of the private sector under the “Battle of Ideas.” The substantial economic aid provided by Venezuela under Hugo Chávez allowed Fidel to embark in a new ideological cycle, rejecting several reforms that he had grudgingly accepted to halt the crisis of the 1990s. After becoming Cuba’s leader in 2006, Raúl Castro promised structural reforms and stimulated a debate on economic and social changes that turned to be the broadest and deepest under the revolution. Cuban economists proposed reforms ranging from the transformation of property to greater opening to foreign investment. Measures implemented by Raúl in the new “pragmatic” cycle are positive but few, of small magnitude, and geared to benefit the highest income group. Only the distribution of idle state land in usufruct comes close to a structural reform, but it is weakened by numerous restrictions and disincentives to produce. The most important measures announced by Raúl or recommended in the debate have not been implemented: elimination of monetary duality; end of rationing; legalization of the sale of houses; increase in self-employment and authorization of small private businesses; expansion of foreign investment; granting of autonomy to cooperatives; elimination or radical transformation of the state procurement (acopio) system; and greater flexibility to citizens to leave the country and travel abroad. After the 2008 hurricanes that caused damage tantamount to 20% of GDP, the reforms have been paralyzed, precisely when they are most urgent and necessary. The world economic crisis also had adverse effects in the second half of 2008 and its effects are expected to worsen in 2009. The possibility of adopting Chinese or Vietnamesestyle reforms, which have generated high economic growth while maintaining political control by the communist party, seems to be discarded in Cuba. After 50 years and despite his physical deterioration, Fidel continues to influence key economic decisions and obstructs needed fundamental changes. With the dismissal and replacement of 13 top leaders in the spring of 2009, Raúl has taken virtually complete control of the government; although the impact of those changes on the economic strategy is not completely clear yet, it seems in the opposite direction of further market-oriented reforms. Currently we have internationally standardized methods for measuring social and economic development that did not exist in 1958, for example the Human Development Index that began to be calculated in 1990. Similarly, in 1958 we lacked measures of GDP per capita in dollars calculated using purchasing parity power (PPP) exchange rates. Furthermore, international and regional organizations such as the United Nations Development Program (UNDP) and the Economic Commission for Latin America and the Caribbean (ECLAC) have not been able so far to measure this indicator in Cuba in a reliable manner. Two different currencies circulate in Cuba: the national peso and the convertible peso. The latter actually is not traded in international markets, but its value is unilaterally fixed by the Cuban government. In addition, there are several exchanges rates for the dollar, while in 1958 the peso was convertible at par with the dollar in international markets. In 1958 there were no internationally standardized methods to measure crucial social indicators such as poverty incidence (ECLAC started to calculate it in 1970 for the entire region) and the Gini inequality coefficient.3 Moreover, Cuba’s revolutionary government has not published these indicators although some estimates by academics are available. Regarding literacy and housing, the 1953 Census provided the most recent data for the pre-revolution era. Concerning health care, reporting on diseases in 1958 was probably more deficient than in 2008. It is not possible to make comparisons back to 1958 with respect to indicators such as internet access or number of mobile phones. Considerable progress has occurred in almost all Latin American countries during the past half century, so it is reasonable to expect that Cuban indicators also would have improved. Despite some recent improvement in the access to government statistics, Cuba is lagging behind of Latin American countries in this regard. 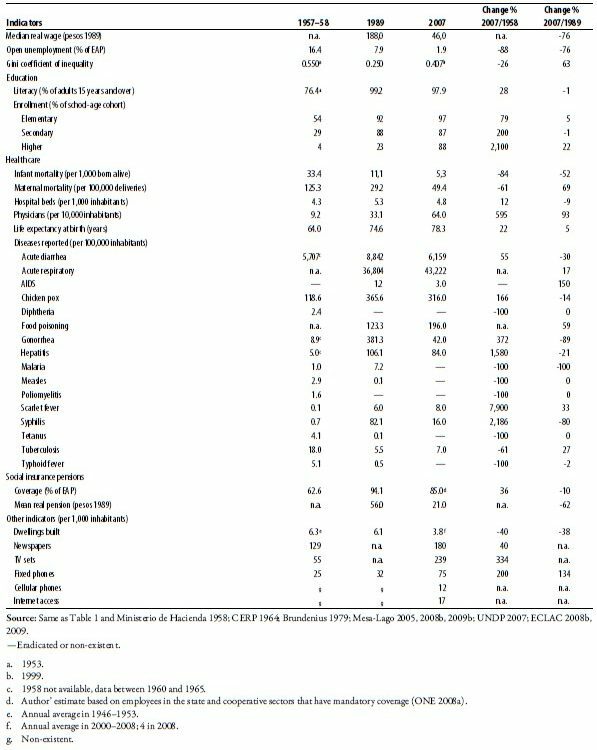 For example, the latest ECLAC annual report (2008) includes indicators for Cuba only with respect to 10 out of 23 comparative tables. Several Cuban indicators (for instance GDP and open unemployment) are statistically altered through the use of calculation methods that do not follow standard international methodology, thus impeding adequate comparisons with other countries in the region. In addition, the government has not published the basic data needed to check the reliability of other indicators such as the Consumer Price Index (CPI). The Cuban population has increased 65% in the last fifty years and it is necessary to adjust absolute production figures to said demographic change (e.g., absolute production might have increased 65% but be stagnant in per capita terms). Many Cuban statistical indicators improved albeit with oscillations until peaking in 1989. Most of them severely deteriorated during the economic crisis of the 1990s that resulted from the collapse of the socialist camp. Although many indicators have improved, others are still below pre-crisis levels. Therefore, comparing Cuba between 1958 and 1989 yields different results from comparing it between 1958 and 2008. Some of these problems can be solved easily, for example calculating production per capita,4 but other problems are more complex, for example the comparison of the value of the currency in terms of U.S. dollar over time, for which alternative estimates will be supplied. In order to comparatively measure the progress of Cuban indicators in the last fifty years, they will be ranked whenever possible with the 20 countries in the region,5 which will allow us to evaluate any advance, stagnation, or regression over time. This approach will also reduce the problem of deficient reporting of diseases in 1958 vis-à-vis 2007, as we assume that all the countries in the region faced similar problems. Statistical alterations in some Cuban indicators will be explained and socio-economic comparisons between 1958 and 2008 carried out to estimate the degree of recovery of such indicators during the Special Period. However, there are some intractable problems, such as the lack of indicators in 1958 for reason of technological progress. In those cases, current data on Cuba will be given for regional ranking purposes. Finally, as this is an innovative essay attempting to deal with a complex and controversial research topic, it must be considered as a preliminary work, subject to future refinement. Tables 1, 2 and 3 compare Cuba’s domestic and external economic and social indicators for 1958, 1989, and 2007–2008, whereas Table 4 compares Cuba’s ranking within Latin America between 1953– 1958 and 2005–2007. 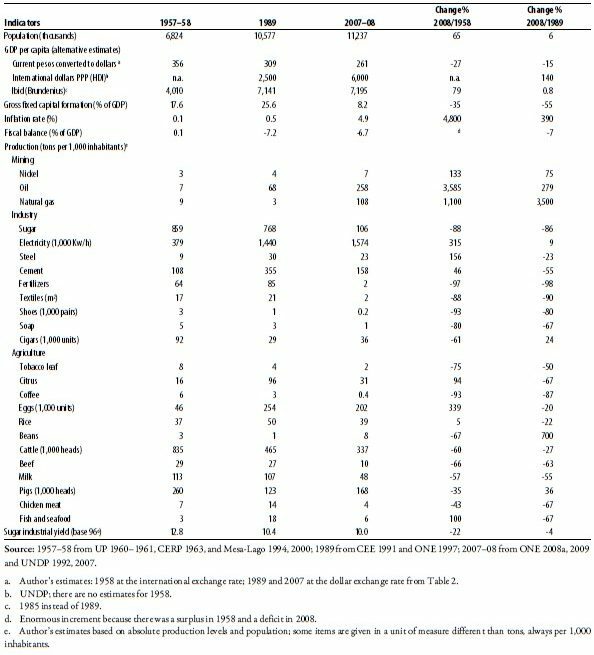 Taking into account the above caveats, Table 1 shows GDP p/c for the three observation years following three alternative methods. The first, in current pesos converted to dollars at the current exchange rate, but not adjusted for inflation, shows a fall of 27% in 1958–2007 and 15% in 1989–2007. The second, from the Human Development Index, offers a “preliminary estimate” of Cuban GDP p/c of 6,000 international dollars (PPP) for 2005, with a footnote (repeated for five years), which states that it is “making efforts to produce a more trustworthy estimate”; even if we use this unreliable estimate, Cuba ranked in 12th place in 2005 among the 20 Latin American countries, surpassing only the eight least developed (UNDP, 2007).8 The third, by Brundenius (2009), estimates Cuban GDP p/c, also in PPP dollars, in 1958, 1985, and 2007, showing an increase of 79% in 1958–1985, but stagnation in 1985–2007, and ranking Cuba 7th in this dimension in 1958, 5th in 1985, and 11th in 2007.9 Although the comparisons are not exact, Cuba’s GDP p/c ranked 3rd in the region in 1958, and descended to 9th, 11th, or 12th place in 2007. Gross fixed capital formation relative to GDP was 17.6% in 1957, the 5th highest in the region, increased to 25.6% in 1989 (also one of the highest), and fell to 8.2% in 2007, the lowest among the 20 countries and one third of the regional average of 22% (ECLAC, 2008a). Some Cuban economists estimate that a level of 25% is needed for sustained economic growth (Pérez Villanueva, 2006). The inflation rate in 1958 was virtually zero (UP, 1960). Cuba has not made public the basic basket used to calculate the CPI. Despite state control over virtually all prices, inflation increased 0.5% in 1989. Thereafter, the CPI excludes sales in hard-currency shops (tiendas de recaudación de divisas, TRDs) in which the 65% of Cubans who have access to foreign currencies make purchases, thus underestimating the CPI and inflation. Even taking this into account, inflation increased to almost 5% in 2008 (ONE, 2009), 49 times the 1958 level. The fiscal balance as a percentage of GDP in 1958 was a small surplus of 0.1%, but it turned into a deficit close to 7% in 2008, in contrast to an average regional deficit of 0.5% (ECLAC, 2008a). 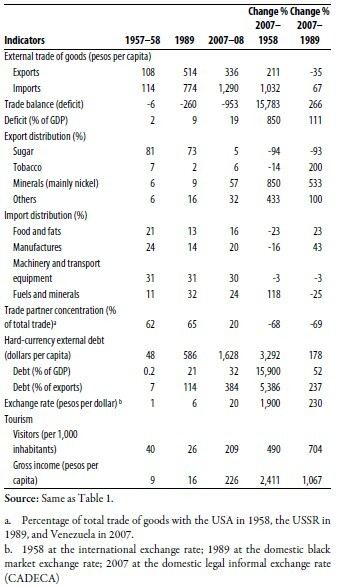 Table 1, based on official absolute production figures but calculated per 1,000 inhabitants to adjust for population growth, selects 24 products that are representative of mining, industry and agriculture, for exports and domestic consumption, whose performance the author has followed for fifty years. With regard to almost half of them, production increased and peaked in 1989 (for some products in 1985) and later decreased. For 14 products, the 2007 output level was below that of 1958, while for ten products it was above it. Performance differed by sector: excellent in mining (owing to foreign investment that began in the 1990s), poor in industry, and terrible in agriculture. In mining, after an initial fall, production of natural gas jumped 12 times in 1958–2007 (even so, it only accounts for 22% of total fuel production); that of oil grew 36 times in the period but only satisfies 35% of domestic needs and the rest is imported mainly from Venezuela; and nickel production grew 133% in the period. Since 2003, however, oil production has declined and nickel production stagnated. In 1989–2007, output of the non-sugar manufacturing industry declined by 85%: out of eight manufactures, five were below the 1958 output level and three above. In 1958–2007, production per 1,000 inhabitants of fertilizers, textiles, shoes, and soap shrunk between 80% and 97%. In comparison, steel output increased 156%, but dwindled 23% in 1989–2007, whereas that of cement rose 46%, but later fell 55%. Electricity generation jumped 315% over the entire period, but only 9% since 1989. Sugar production declined 88% in 1958–2008, from 8 to 1.2 million tons, and the 2007 sugar cane harvest was the worst in terms of output since 1903. The industrial yield in the sugar sector decreased 22% in the period, from 12.8 to 10. Out of twelve agricultural products in Table 1, the 2007 levels of eight of them were far below their 1957 levels and only four were above. Production of tobacco leaf, coffee, beans, beef, poultry meat, milk, and the number of cattle heads and pigs in 2007 was between 35% and 93% lower than in 1958. Meanwhile production of citrus, eggs, rice, as well as fish and shellfish, was between 5% and 339% above 1958 levels, although after 1989 all of them declined between 20% and 67%. In 2007, 19% of the economically active population (EAP) in agriculture generated only 3.9% of GDP, which demonstrates its low productivity and in large part explains the sector’s poor performance. The comparison of external sector indicators exhibits mixed results (see Table 2). In 1957–2008, the value of exported goods in pesos per capita increased 211%, while that of imports shot up 1,032%, hence the trade balance deficit jumped nearly 17 times, and as a percentage of GDP grew 850%. The comparison between 1989 and 2008 shows that in the last year, exports were 35% below pre-crisis level while imports were 67% above. Furthermore, the deficit worsened 266%, setting a historic record of 10.7 billion pesos in 2008, equivalent to 19% of GDP. The Cuban economy has been increasingly less capable of generating export commodities with which to finance imports (due to poor production performance, except in energy and mining), meaning that the trade goods deficit has progressively worsened, especially during the Special Period. The distribution of exports displays greater diversification. The historic dependence on sugar has disappeared, but at a great price: sugar’s share in total exports fell from 81% to 5% in the period, most of the decline occurring after the 2002 industry restructuring that halved the sugar cane planted area and the number of mills; because of this, production decreased 86%, as did exports. The drastic reduction of sugar’s share resulted in proportional increases in other export shares. The value of tobacco exports also decreased albeit only 14% in 1958–2007, but it doubled during the Special Period, partly because of moderate increases in production, but also due to the rise in the world price of Cuban cigars. The greatest success has been the boost in the share of minerals—principally nickel—from 6% to 57% of total exports. This was the outcome of a substantial raise in nickel output during the period (although output has been stagnant since 2001) and more so the jump in world prices of this metal in 2006–2007. However, said price plunged 81% in 2008 and it might decline more in 2009; hence nickel’s share of total exports will also fall. Other exports went up 433% in the period, especially fish and shellfish, citrus and other fruits, and rum, but due to the fall in output of all of these during the Special Period, their export share decreased; they were replaced by medicine and cement, despite a severe contraction in their production that provoked acute domestic scarcity (ONE, 1997, 2008a). The percentage distribution of imports shows smaller changes. The import share of food and fats decreased 23% in 1958–2007, but rose 23% during the Special Period due to the collapse of agricultural production; in 2008, Cuba imported 84% of its basic food basket at a cost of $2.5 billion. Manufactures’ share fell 16% in the entire period, but grew 43% after 1989 due to the de-industrialization process (industry generated 28% of GDP in 1989 but only 15% in 2008). The share of heavy machinery and transport equipment was virtually the same over the period. Meanwhile, the share of fuels rose 18% in 1958–2007, but decreased 25% after 2003, when Venezuela became Cuba’s principal oil supplier, exporting oil to Cuba at the preferential price of $27 per barrel, against a world market peak of $147 in 2008. A significant advance is the 68% reduction in the concentration of foreign trade of goods in a predominant partner, which increased from 62% with the United States in 1958 to 65% with the USSR in 1989 (72% in 1987), but decreased to 20% with Venezuela in 2008. This figure, however, hides the enormous economic aid offered by Chávez, whose credits, subsidies, and investments were estimated at $9.4 billion in 2008 (more than the USSR gave in any year during its 30 year relationship with Cuba), including: (1) payment of US$5.7 billion for services of 40,000 Cuban doctors, teachers and other professionals working in Venezuela; (2) supply of 97,000 barrels of crude oil and derivatives (65% of total Cuban demand) with a price subsidy of US$2.4 billion; and (3) investments in 76 projects valued at US$1.4 billion (Mesa-Lago, 2009a). Cuba’s balance of goods deficit of US$10.7 billion in 2008 was in large measure compensated by a balance of services surplus of US$8.2 billion, 69% of which was generated by professional services sold primarily to Venezuela. However, the 72% fall in the price of the barrel of oil in 2008 and Venezuela’s enormous budget deficit in 2009 creates strong pressure to reduce that country’s assistance and subsidies to Cuba. Despite the efforts to diversify its commercial partners (toward China, Russia, Brazil, etc. ), Cuban dependence on Venezuela is formidable, and Cuba could confront a second Special Period if Chávez’s help ends or is reduced considerably (Mesa-Lago, 2009a). The external debt in dollars per capita10 (excluding the debt with Russia, estimated at US$21 billion) jumped 33 times between 1958 and 2008; as a percentage of GDP it increased 160 times, from 0.2% to 32%, and as a proportion of exports, it grew 54 times, from 7% to 384%. In 2008, Cuba’s external debt in dollars per capita was the 7th highest in the region; if the debt to Russia were included, the total would have increased to $3,410, the 2nd highest in the region and 162% greater than the regional average of $1,302 (based on ECLAC, 2008a). In 1958, the Cuban peso was exchanged at par with the U.S. dollar in the world market. Since 1962, the peso is not traded internationally and the government unilaterally sets the exchange rate. After the crisis of the 1990s, Cuba had two domestic currencies in circulation: the national peso (peso nacional, PN), and the “convertible” peso (peso convertible, CUC) that is not actually convertible, because it is not traded in the international market; the U.S. dollar was also legal currency in 1994–2004. Currently, there are various exchange rates: one dollar for 0.80 CUC, while one CUC is exchanged for 24 PN, hence one dollar equals 20 PN.11 The PN/dollar exchange rate deteriorated 1,900% between 1957 and 2008, from 1 to 20 pesos to the dollar. According to some Cuban economists, the CUC is overvalued, which causes economic distortions and disincentives for productivity and exports (Vidal, 2009). The number of tourists decreased from 1958 until 1989, but grew afterwards, and increased five-fold between 1958 and 2008. Gross revenue from tourism jumped 24 times (especially after 1989) so that tourism is the largest hard-currency generator after professional services paid by Venezuela, whereas revenue from nickel exports ranks 3rd. The number of hotel rooms has quadrupled, but only 46% were occupied in 2008 (ONE, 2009). The tourism sector is excessively dependent on imports of goods for visitors, which reduces the industry’s net revenue and does not create a strong “multiplier” effect. Remittances from abroad are probably the 4th largest source of income. Remittances decreased since 2005 due to restrictions imposed by the Bush administration, a tax charged by Cuba on the dollar, as well of the artificial appreciation of the “convertible” peso that reduces the value of remittances by 20%. The few successes in the external sector and domestic production are due in large part to foreign investment, but the number of mixed enterprises with foreign capital decreased 22% in 2002–2007; the government closed many of them and has declared that it is only interested in large-scale investment in strategic economic sectors (Mesa-Lago, 2009a). Cuban leaders blame the American embargo for the economic problems analyzed herein, but since 2002, the bulk of food imports come from the United States, which in 2007 was Cuba’s fifth-largest trading partner. Without diminishing the adverse effects of the embargo, the fundamental cause of said problems has been the economic policies of the past half century: collectivization and centralization of virtually the entire economy, seven changes of economic organization and four in development strategy, and a drastic cut in individual incentives. Despite the substantial former Soviet help and current Venezuelan aid, Cuba has failed to transform its production structure, achieve food self sufficiency, and generate enough exports to pay for its growing imports. In contrast to the aforementioned indicators in which the performance is negative or mixed, with a predominance of adverse performance, the performance of social indicators is largely positive. Notwithstanding, said indicators experienced a worsening during the crisis, and despite their later recovery, many have still not returned to 1989 levels (see Table 3). It is impossible to compare real salary (adjusted for inflation) between 1957 and 2007, but it is possible to do so between 1989 and 2008, when it diminished 76% despite nominal increases in recent years. Raúl Castro has recognized the inadequacy of Cuba’s salary to cover basic needs. Current rationing quotas only cover a week of food per month and the rest has to be purchased in free agricultural markets and the TRDs, at prices 90 to 300 times greater than those of rationing (Mesa-Lago, 2009b). The official open unemployment rate declined 88% between 1956–1957 and 2008, from 16.4% to 1.6% of the EAP, the lowest in the region. But it is not consistent with international statistical practice because it includes dismissed workers in retraining, students who do some type of labor, and part-time workers involved in backyards and urban gardens growing food for self consumption. Furthermore, 60% of the EAP was “estranged from work” in 2008, and Cuban economists estimate that between 30% and 40% of jobs are unnecessary and that hidden unemployment and underemployment have increased (Sánchez and Triana, 2008; Monreal, 2009). One of the problems that Cuba confronted in 1958 was the enormous gap in social indicators between urban and rural zones. For instance, the national illiteracy rate averaged 23.6% in 1953, but in urban areas it was 11.6% while in rural areas it was 41.8%. Most of these inequalities have been notably reduced under the revolution. Income inequality official figures are unavailable for 1958, but there are some Cuban and foreign estimates for 1953 and between 1986 and 1999: the Gini coefficient decreased 26% in 1953–1999 (from 0.550 to 0.407), but it rose 63% in 1989–1999 (from 0.250 to 0.407); estimates are not available after 199912 (see Brundenius, 1979; Mesa-Lago, 2005; Añé, 2007; Espina, 2008). These estimates exclude foreign remittances, an important source of income for twothirds of the population, although a third does not receive any. If remittances were included, the Gini coefficient would be much higher. The revolution expanded the free national public education system (thus reducing the previous access gaps between urban and rural zones and income groups), expropriated non-state schools and universities, and prohibited private teaching. There is no literacy estimate for 1958; the most recent figure was 76.4% from the 1953 census,13 whereas it reportedly increased by 27% to 97.9% in 2006. Based on the 1953 figure, Cuba ranked 4th in the region (UP, 1960), while in 2006 it had ascended to 2nd. Primary school enrollment grew 79% between 1955–1956 and 2006, and in 2006 Cuba ranked 6th in the region in this dimension, whereas secondary school enrollment increased 200%, placing Cuba ahead of Latin America. Higher education enrollment, which dramatically fell during the crisis, experienced an explosion from 2003 onwards, jumping 22 times in 1958–2007 and catapulting Cuba to first place in 2006 (regional comparisons based on ECLAC, 2009). The 282% growth in higher enrollment between 1989 and 2007 was distributed very unevenly among various university disciplines: 3,940% in humanities and social sciences, 705% in education, and around 400% in medicine and economics. Enrollment grew by only 40% in technical and agricultural sciences and it decreased 39% in natural sciences and mathematics. Despite the enrollment boom in education and a more moderate one in agronomy, a serious deficit is reported in both fields (between 17% and 30% of students drop-out before graduating) and Cuban experts are worried about the fall in scientific training. Cuba probably has the best educated population in the region, but the considerable investment in human resources is partly lost due to the low wages paid and lack of incentives that force professionals to emigrate or stay but abandon their state work and shift to private non-professional activities that allow them to survive (Mesa-Lago, 2009b). The revolution expanded the free public health system, confiscated health-care cooperatives, mutual-aid organizations and private providers, and prohibited the private practice of medicine. The virtual universalization of access reduced the gap between urban and rural areas—rural hospitals increased from one to 62—and among income groups. Infant mortality decreased 85% but continued being the lowest in the region in 1957 and 2007, 14 while life expectancy at birth increased 22% moving Cuba from 4th to 3rd place. Doctors per 10,000 inhabitants jumped six times and elevated Cuba from 3rd to 1st place,15 and hospital beds per 1,000 inhabitants grew 12%, maintaining the top spot. Maternal mortality declined 61% in the period, improving from 5th to 4th place, despite a 69% increase from 1989 to 2006. Out of 13 diseases tracked between 1957 and 2007, six were eradicated (diphtheria, malaria, poliomyelitis, measles, tetanus, and typhoid), one was reduced (tuberculosis), and six increased (gonorrhea, acute diarrhea, scarlet fever, hepatitis, syphilis, and smallpox). Out of the six diseases on which a regional comparison is feasible between 1957 and 2006– 2007, Cuba remained the country with lowest incidence in three and improved in the other three. Coverage of the EAP by social security pensions (old age, disability, and survival) was 63% in 1958, the second highest in the region (CERP, 1965). The revolution expanded coverage, especially among non-salaried state agricultural workers and cooperative members, but without publishing statistics. Self-employed workers and private farmers do not have obligatory coverage and, although they may affiliate voluntarily, are charged a contribution of 12% on their income (a contribution paid by enterprises for their employees); hence their coverage is nil or very low. The author estimated that 94% of the EAP was covered in 1989, but with the modest increase in non-state sector employment beginning in 1994, coverage probably fell to around 85% by 2007. Even at this level, it would have risen 36% between 1958 and 2007, as Cuba ascended from 2nd to 1st place in the region. It is impossible to estimate the mean real pension in 1958, but between 1989 and 2008, it fell 62%. One recent poll revealed that old-age persons are among the poorest groups in the country (Añé, 2007). The Cuban population is the second oldest in the region and pensions for 1.5 million people accounted for 7% of GDP in 2008; contributions on wages paid by enterprises are insufficient to cover pension costs and the state finances the deficit, which is the equivalent of 3% of GDP. To contain the deficit, a December 2008 law increased the retirement age and the required working years to qualify for a pension, as well as established a contribution of 5% on workers wages, but these measures are insufficient to balance the system financially in the long-term (Mesa-Lago, 2009b). There are no figures for 1958 on the construction of housing per 1,000 inhabitants, but it averaged 6.3 annually in 1946–1953 versus 3.8 in 2000–2008, a fall of 40%. According to the 1953 census, 52% of existing homes were in good condition and 42% in mediocre (regular) or bad condition (the condition of 6% of the homes was unknown); the National Housing Institute reported in 2007 that 57% of homes were in good condition and 43% were in poor or mediocre condition, hence showing no significant change. The three hurricanes that struck Cuba in 2008 destroyed or damaged 600,000 homes, therefore the state of housing should have worsened and the housing deficit now most likely exceeds one million units (Mesa-Lago, 2009b). Landline telephones increased three-fold between 1958 and 2007, but Cuba’s regional ranking decreased from 3rd to 18th, while television receivers per 1,000 inhabitants maintained its 3rd place ranking. In number of cars and newspapers per 1,000 inhabitants, Cuba dropped from 5th and 3rd place, respectively, in 1958 to last and 16th places in 2007. In internet access and mobile telephones, Cuba ranked last in the region in 2005, surpassed even by Haiti (based on ECLAC, 2009). Out of a total 84 indicators in Tables 1–3, 29 related to the domestic economy, 19 to the external sector, and 36 to social issues. Between 1957 and 2008, performance worsened with respect to 66% of domestic economic indicators and improved with respect to 34%, with the best performances in mining; between 1989 and 2008, 72% of those indicators were well below the pre-crisis level, while 28% were above. With regard to the external sector, approximately half of the indicators improved between 1957 and 2007 and the other half worsened; whereas 63% in 2008 showed lower performance than their pre-crisis level and 37% showed higher performance. The best performance was in social indicators: between 1957 and 2008, 76% showed improvement and only 24% worsened; but in 2008, 52% were below the pre-crisis level and only 48% had surpassed such level. Table 4 compares Cuba’s rank between 1953–1958 and 2005–2007 within the twenty Latin American countries regarding 39 indicators for which information is available. For 10 of these (all social) there are no figures for one of the two historical points or there are comparison problems, but they are included because inferences can be made even if the necessary data are not available. In order to facilitate this exercise, domestic and external economic indicators were merged (for a total of 15), with 24 social indicators. Cuba’s performance was overwhelmingly negative with respect to the economic indicators: for 87% of them, Cuba’s position fell within the region and for 13% it remained the same. Social indicators showed a more positive evolution. For the 14 comparable ones, there was improvement in position for 43%, 36% remained unchanged, and 21% decreased. With regard to the 10 non-comparable indicators, 2 out of the 3 that measure school enrollment in 2007—secondary and higher education—probably improved their ranking, while for primary school enrollment the rank probably decreased. Out of 5 indicators that measure morbidity, 3 diseases were eradicated in the region in 2007, so Cuba maintained its position in malaria and probably improved it in poliomyelitis and diphtheria; Cuba was 1st and 2nd, respectively, regarding scarlet fever and typhoid in 1958, so there should be no significant change by 2008. Cuba ranked last in the region in both mobile telephone use and internet access in 2005. Taking into account these inferences, the final distribution of the social indicators would be: 46% improved, 27% remained roughly unchanged, and 27% declined. It should be noted that the fall in rankings regarding the economic indicators is quite remarkable: the arithmetic mean of the 15 indicators in 1953–1958 is 4.5, while in 2005–2007 it is 10.3. In contrast, change in the 18 social indicators is considerably less: the 1953– 1958 arithmetic mean is 2.9 and increases to 5.5 in 2005–2008, due to the weight of the “other” indicators; excluding them would result in an average of 2. To arrive at more robust conclusions would require additional indicators, especially in the external sector of the economy, as well as filling holes in various social indicators and developing techniques to measure the purchasing power of income and the quality of social services. Although exploratory, this essay has shown that in the past fifty years, Cuba suffered severe economic deterioration (particularly domestic, which in turn affected the external sector), accentuated during the Special Period. With regards to social indicators: based on the figures in Table 3, the great majority of them improved, but in 2008, half still had not recovered their 1989 level. Turning to regional rankings (Table 4), with respect to almost half of the indicators, Cuba improved its position while it stagnated or worsened with respect to the other half. To improve the dismally poor economic performance of five decades, it is essential to advance in the structural reforms announced by Raúl Castro, recommended by Cuban economists, and currently at a standstill, while the beneficial but costly social services should be made financially sustainable in the long-term. 1. Although being responsible for the contents of this essay, the author gratefully acknowledges a small research grant from the Center for Latin American Studies at the University of Pittsburgh; valuable comments from Jorge Pérez-López, Claes Brundenius, and Manuel García, and bibliographical assistance from Lesbia Orta Varona and Esperanza de Varona, Cuban Collection, University of Miami. A Spanish version of this essay is being published in América Latina Hoy (Universidad de Salamanca), 52 (August 2009). 2. Estimated at $65 billion in 1960–1990, out of which only 39% were loans and 0.6% were repaid. 3. The Gini coefficient was invented in 1912 but was not estimated in some Latin American countries using a standardized methodology until the 1960s. 4. Because per capita estimates often resulted in small decimals numbers, it was decided in those instances to calculate them per 1,000 inhabitants. 5. Several countries of the English-speaking Caribbean, such as Antigua and Barbuda, Bahamas, Barbados, Grenada, and Trinidad and Tobago, had better economic and social indicators than Cuba in 2007–2008 (ECLAC, 2009), but because they were part of the British Commonwealth in 1958, there are no indicators for that year. 6. The “Truslow Report” of the International Bank for Reconstruction and Development (1951) ranked Cuba in 2nd place in GDP p/c in 1947; according to Oshima (1961) Cuba was 4th in 1953. 7. The latest revision of national accounts by the National Statistics Office (Oficina Nacional de Estadísticas, ONE, 2008b) is limited to the 1996–2007 period, making impossible a comparison of current GDP with that of 1989, much less than with 1958. 8. ECLAC (2009) calculates Cuban GDP p/c at constant prices converted into US dollars of 2000 at $4,173, ranking it 9th in the region. 9. Pérez Villanueva (2008) shows that the highest GDP growth rates at constant prices occurred in the mid-1960s and at the beginning of the 1980s, not in 2004–2007. 10. Cuba differentiates between its “active” debt of $7.8 billion, which is being serviced, and its “fixed” debt of $7.6 billion, which has not been restructured since 1986; the sum was $15.4 billion in 2007 (ONE, 2008a). Only the first is shown in the ONE tables (although with a footnote that gives the second) and the same is done by ECLAC (2008a). The Economist Intelligence Unit calculates that in 2008, the combined debt was $18.3 billion, a figure used in Table 2. The Paris Club reports the debt at $29.7 billion in 2008 (Mesa-Lago, 2009a). 11. ECLAC publishes an exchange rate of one dollar equal to one CUC and 24 PN, without specifying the currencies. 12. ECLAC (2006) gives the Cuban Gini coefficient in 1996–1998 as 0.38, ignoring the most recent available figure of 0.407 for 1999, which was higher. 13. A comparison between the 1899 and 1953 census (based on absolute figures quoted from Espinosa Chepe, 2008), shows an average annual increment of 0.6 percentage points in literacy that when projected to 1958 account to 3 points, thus grossly estimating literacy at 79.4% in 1958. In the 54 years elapsed between 1899 and 1953 literacy rose 33 percentage points and between 1953 and 2006 it increased 22 points, although the higher the literacy rate, the more difficult it is to reduce it. 14. In the 32 years between 1926 and 1958, infant mortality decreased 25 percentage points, while it fell 23 points between 1958 and 1990. 15. In dentists per 10,000 inhabitants, Cuba ranked in third place in 1958 and 2006 (UP, 1960; PAHO, 2007b). 16. A previous comparison of eight health indicators in Cuba with the rest of the region in 1990 and 2002 showed a decline in Cuba’s rank with respect to four, maintaining first place with respect to three, and improvement in one, while the average ranking of all indicators continued to place Cuba first (Mesa-Lago, 2008a).